English: Malaria is caused by a parasite (Plasmodium) transmitted to people and animals by mosquitoes of the genus Anopheles. The sporozoite life-stage of the parasite develops inside oocysts and are released in large numbers into the hemocoel of mosquitoes. 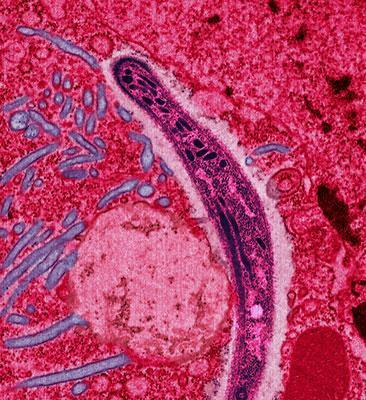 This false-colored electron micrograph shows a sporozoite of Plasmodium bergei migrating through the cytoplasm of midgut epithelia of an Anopheles stephensi mosquito. Français : Sporozoite de Plasmodium bergei, l'agent du paludsime des rongeurs (malaria).